Operating a team in the Cape Cod Baseball League is no simple task. From building a team to maintenancing fields, expenses can surmount to hundreds of thousands of dollars every summer. With donations serving as an integral part of a team’s financial makeup, fundraisers are an effective way for teams to collect donations while giving back to the community. 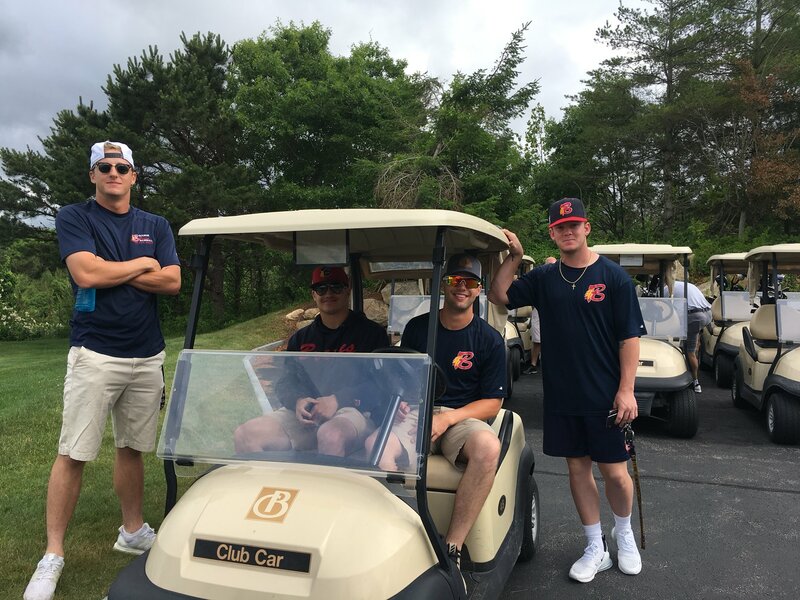 On June 25, the Bourne Braves held their second annual golf tournament at The Brookside Club in Buzzards Bay. Between numerous hole sponsors, silent auctions, a 50/50 raffle and the event itself, fundraising director Steve Minaudo credited the helpfulness of the Bourne community to ensure that the tournament would be a success. “It’s a year-long adventure. We go around and ask and solicitate our donors, our neighbors and they’re more than generous and that’s the only way that we can get the tournament to where it is today,” Minaudo said. Taking advantage of fewer children being in school, Minaudo guessed that around 25 more golfers attended the event in 2018 than in its inaugural year, bringing the number of participants to nearly 100. He estimates that this year’s tournament will generate a healthy net gain for the Braves organization. As the town of Bourne came out on Monday to support the Braves, the team reciprocated as every player on the 2018 roster was in attendance and took the chance to meet various members of the community. “We’re always playing everyday and what not. It’s good to have an off day and come out here and support people that support us,” pitcher Greer Holston said. For the players, events like these are an opportunity to take a break from baseball, giving the team’s Board of Directors a chance to learn about their players outside of the lines.